What are your goals? What do you want to achieve by being here? This is a list of many questions designed to let us know where your biggest problems are. (You can take this test on line!) Go to Take Health Test. How often did you take antibiotics or other drugs? When was the last time you felt well? When was the last time a doctor asked you about your diet? What things have you tried that helped? What have you tried that didn't help? How is your problem affecting your life? Has anyone ever helped you understand how all your health concerns are linked together? We have a very comprehensive questionnaire that enables us to develop a database of your medical history. This helps us to focus in on the most stressed and toxic areas of your body and to give us an accurate picture of your current health level. We will be happy to go over part the information you provide us in the symptom survey over the phone. 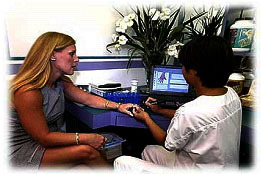 Then we can determine if you are a good candidate to come in for a more comprehensive health assessment. We are also specially trained to palpate the spine, the head and acupressure points to determine which organs or bones are stressed in your body. The relative strength or weakness of different muscles correlates with the energy levels of different organs. The PH of your saliva and urine correlate to the strength of your bodies digestive & elimination system. 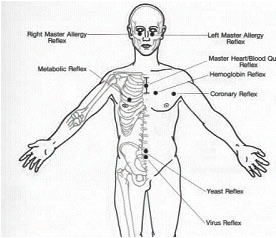 This technique uses body acupressure points to help determine what types of herbs, homeopathic products, or nutrition a patient may require. The human body is like a computer, made up of the brain (electrical generator and memory bank) and thousands of miles of electrical wires called nerves. These nerves connect every organ, gland and tissue of the body. These nerves also connect with "fuses" or "breaker switches" called contact reflexes. By contacting these reflexes, using the body's muscular system as an indicator, we are able to monitor the function of body systems. 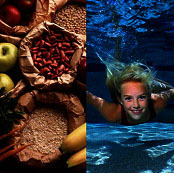 These are two similar systems used to determine what foods are putting a stress on the body and reduced or eliminate the body's reaction to those foods. Dr. Edrich is Certified as an Egoscue Postural Alignment Specialist. The Egoscue method is a method of analyzing posture and how you move in order to determine how your muscles function. The better your muscles function the better your alignment, the better your posture, the less your nerves pinch, the stronger and more balanced you become, the less pain and other symptoms you have. Jack Nicklaus, the famous golfer credits the developer of this technique Pete Egoscue for saving his golf career by utilizing this method. 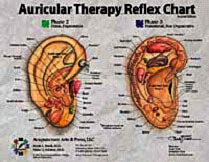 This is a technique whereby we stimulate points on the ear to help balance body energy. This is especially helpful for people who wish to quit smoking, drug addiction and over eating. Some patients need to improve their diet and increase or modify their exercise routines. We provide individualized advice and direction to enhance the effectiveness of other health treatments we may be using to assist you in obtaining your health goals. We integrate the ULTRA LITE program into our protocols. This is a piece of equipment that not only tests the resistance of energy flow over acupuncture meridians, but also helps find the best remedies, herbs, and treatment to unblock those flows and increase your energy, immune system, and metabolism. These tests provide information regarding levels of malabsorbtion, vitamin deficiency, or body oxidation (body "rust"). It also shows if a person has toxic levels of ammonia nitrates and more. These tests can detect health concerns long before disease sets in. These are not ordinary medical tests. You have never been tested like this before. This test measures the body's ratio of fat vs. lean muscle mass. Our equipment provides optimal accuracy. This is an excellent test that provides information about the strength of the autonomic (automatic) nervous system. This measures how well your body can react and adapt to stress or toxins. For more info check out the following website. A Breakthrough in PAIN relief! Results are FAST. We find that 95% of people feel a significant difference, especially from pain, on the FIRST TREATMENT! 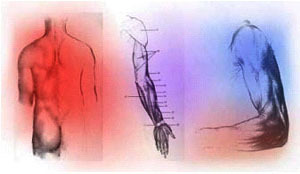 Meridian - The energy flows of the body each meridian has many points on it. This system affects the whole body by stimulating points on the hands, ears arms and legs! By stimulating these specific points we can resolve pain and balance internal organ energy flows.